In this video, we are going to divide polynomials. 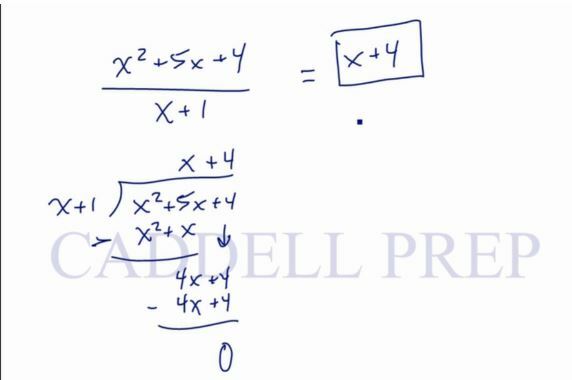 Let’s go over how to divide polynomials. First, we have a polynomial divided by a single term. We’re going to factor this first and see if we can cancel out. Similarly, we can do the same thing if we divide by polynomial. We can’t factor the numerator. So we definitely can’t factor and reduce. So what we’re going to do is long division. Now, let’s get back and solve using long division. Since is a binomial or has tow terms, it cannot go into alone. The question is how many times does goes into ? The most important thing to look at is the -terms, you can ignore the other numbers for now. So, what can we multiply to to get ? Now we have to subtract and bring down the last number. How many goes into ? Again, let’s just focus on the . Now, let’s look at our first example. Now, let’s just divide this using long division. Just like when we factored and reduced.